Breaking Records with our Stockpile Conveyor for Brett Aggregates. Brett Aggregates are one of the leading suppliers of sand and gravel(both marine and land won), crushed rock, asphalt and recycled sub-bases to the building and civil engineering markets in London and the counties of southern and eastern England. Operating over 30 supply locations across the region and with total aggregate sales in excess of 4 million tonnes a year, Brett Aggregates forms a key part of the long established and highly successful Brett Group, one of the U.K’s largest independant suppliers of construction materials. Atherton Material Handling Limited (AMH) were approached by Brett Aggregates to design and install a conveyor system that would not be comprimised by the soft, unstable ground near the River Thames. A.M.H were able to look at this situation and brief and redesign the existing Stockpile Conveyor system to come up with a radically revised solution. The conveyor with its robustly engineered and fully galvanised framework, would now run on eight foam-filled earthmover tyres – each with a rated load-carrying capacity of 30 tonnes – mounted in two groups of four in a wide chassis specially designed to spread the weight of the structure and reduce its ground pressure. Believed to be the largest radial conveyor of its kind currently operating in Europe, the vast new structure weighs 150 tonnes and measures 50.3m between centres. 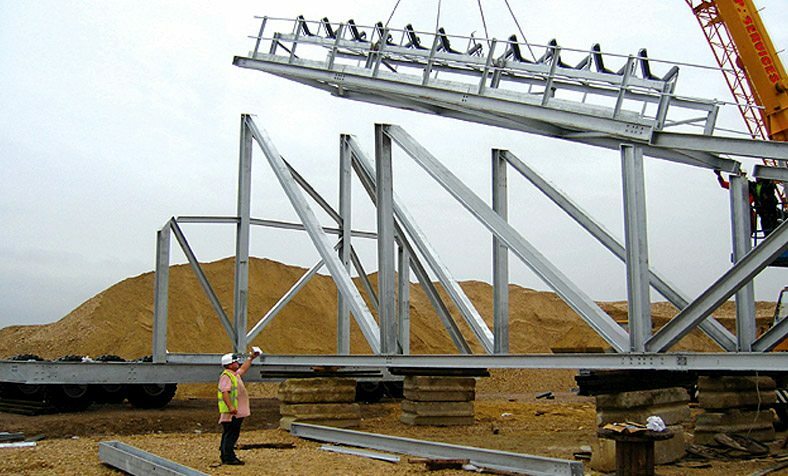 The conveyor itself is inclined 15 degrees, reaches a stockpiling height of 16.6m at its head drum, features double walkways with Davis Derby pull-wires along its entire length, and is fitted with a 1,400mm wide belt that operates at a speed of 2.5m/s. The belt is powered by a 220kW tandem drive system comprimising twin 110kW CMG high efficiency motors and twin Bonfiglioli helical-bevel gearboxes via ceramic-lagged drive drums, while the tail end of the conveyor both sits and rotates on a 1,400mm diameter slewing ring supplied by NBC Group Ltd. Despite the unforseen geotechnical problems and the ensuing equipment redesign, the close working relationship between Atherton Material Handing and Brett Aggregates ensured that the project remained on schedule with completion achieved as planned at the end of September 2007. 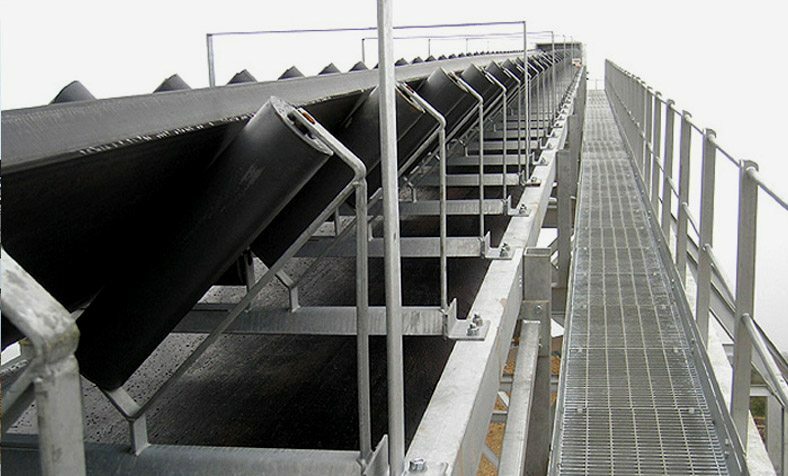 Atherton Material Handling Limited were also responsible for replacing the infeed conveyor linking the reception hopper/feed boot on the berthing jetty to the new radial stockpile conveyor. This involved realigning the original straight-run conveyor path by around 2 degrees, which in turn, required the installation of four new concrete piles in the River Thames. In addition, both the infeed conveyor and the radial conveyor are equipped with primary and secondary scrapers on their respective head drums, and both conveyor drive systems are inverter controlled to ensure smooth, shock free start up. Also, to meet Brett Aggregates’ desired 3,500 tonnes/h stockpiling capacity, both belts have been fitted with 5in (127mm) diameter support rollers throughout, with the two outer elements of each three-part unit installed at the unusually steep angle of 45 degrees, in order to achieve the required tonnage on the 1,400mm wide belts. Cooper 01 bearings have also been used throughout, and all drums (drive, tail, snub, head etc) and rollers utilised on the two conveyors were constructed in-house, complete with ring-lock shaft attachements by Atherton Material Handling Limited.